A new paper published in Earth-Science Reviews reconstructs ocean temperatures over the past 500 million years and finds temperatures were a remarkable ~15-20C warmer 500 million years ago, followed by a generalized cooling curve over the past 500 million years. Note corals evolved ~500 million years ago with these much warmer oceans, and that CO2 levels show essentially no correlation to reconstructed ocean or geologic temperatures over the past 500 million years. Reconstructed ocean temperature over the past 500 million years. Note vertical axis of temperature is on an inverse scale, and shows ocean temperatures were ~15-20C warmer 500 million years ago, followed by generalized cooling over the past 500 million years. Note corals evolved ~500 million years ago with much warmer oceans. CO2 levels show essentially no correlation to ocean or geologic temperatures over the past 500 million years. The temperature of ancient oceans is an important constraint for understanding the climate history of our planet. 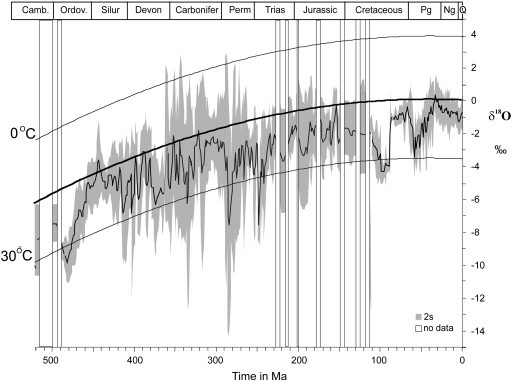 The classical oxygen isotope paleothermometry on fossil shells, while very proficient when applied to the younger (Cenozoic) portion of the geologic record, is believed to yield only unreliable results for the Phanerozoic “deep time”, either because the empirically well documented secular trend to more negative δ18O values with increasing age was generated by post-depositional recrystallization processes or, if primary, implies ecologically unpalatable hot early oceans. Here we present a compilation of δ18O measurements for 58,532 low-Mg calcite marine shells that cover almost the entire Phanerozoic eon, argue that the secular decline of about − 6‰ is primary, propose that it reflects the changing oxygen isotopic composition of sea water, and define a new baseline trend for δ18O of paleo-sea water; the latter providing a new template for calculation of ambient habitat temperatures of fossil specimens. The resulting pattern for fossil taxa (foraminifera, brachiopods, belemnites and bivalves) mimics their modern counterparts in temperature ranges and modes. This conceptual framework enables application of actualistic concepts to ambient habitat temperatures of fossils and provides us with a long overdue tool for interpretation of “deep time” geologic history.